During the Computex we have written countless news about RGB motherboards, fans, coolers and even cables. InWin has unveiled a new RGB case too, but this time we aren't talking about RGB LED but RGB pixels. The company has placed several RGB pixels on the front which can be used to create animated images. With the InWin 307, the company unveils essentially an updated version of current InWin 303. The In Win 307 comes with simple and sleek design and there are no special air-vents present that could have an impact on the looks. Everything is kept in a classic and clean way as it also was the case with the previous model. One of the two panels of the In Win 305 is made entirely from solid tempered glass and allows for looking into the case. Apart from that the front-panel features RGB pixels on it. 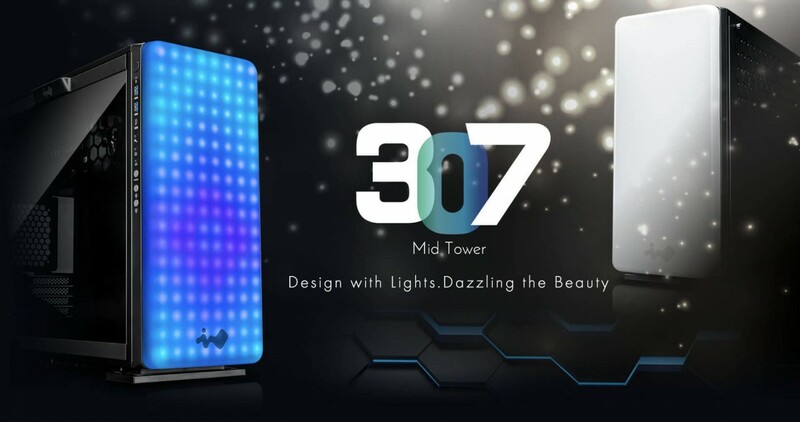 The entire front face is easily programmable with the InWin Glow software, however there are several pre-programmed settings that will let you display the time, soothing animated clouds, a flickering candle flame, and much more. Furthermore thanks to the microphone placed on the top, the animation you choose can dance to the beat of your room. We can already see some crazy integration with Google Home. This case is compatible with ATX, mATX and mini-ITX form factor motherboards. The layout shows that the HDDs as well as the power supply are placed behind the motherboard tray. Additionally there is space for two more 2.5" devices on the back of the motherboard tray. Cooling wise, you can install a 360mm radiator at the bottom and another 360mm one in the top. The In Win 307 should be available for next fall and InWin will sell it around $300 USD. It's not the first time that InWin comes up with such a great idea, for example they did for first the famous "Infinity LED".